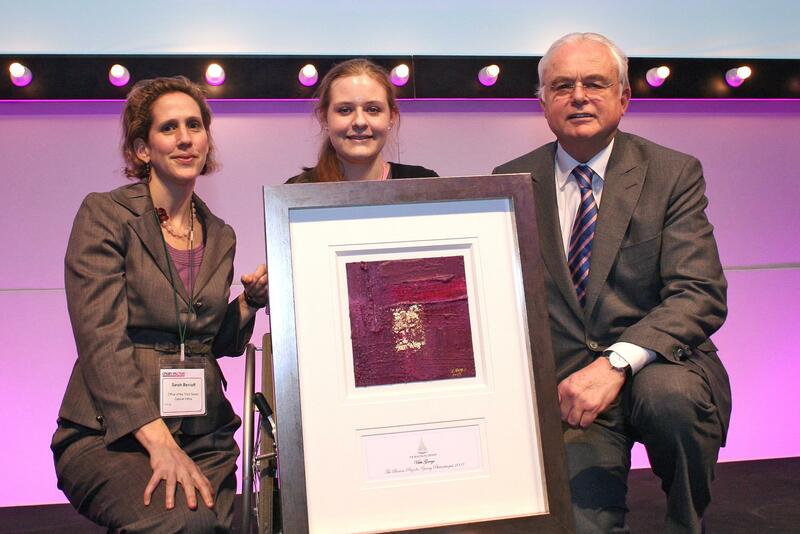 In December 2014, Vikki George received an award from the Prime Minister on her 30th birthday. Vikki was named a Point of Light by David Cameron in recognition of the charity Post Pals, which endeavours to cheer up seriously ill children with cards, letters and gifts. The Point of Light award recognises “outstanding individual volunteers” and a single recipient is chosen by the Prime Minister every day. Vikki won this award in 2010 and was invited to an award ceremony where some top business women had also won awards in other categories. As she was unable to go, Jo Cameron kindly visited Vikki in hospital and presented her with the award. Vikki was told she had been short listed along with around 25 others for the Red Cross Humanitarian Citizen award and was invited to the Houses of Parliament. 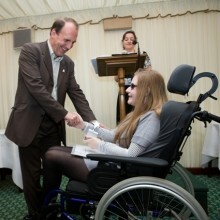 Each person there was presented with a certificate. After everyone had been given theirs they said there was one over all winner and when they called Vikki’s name out people noticed she went very white and looked rather absent for 5 minutes due to such a surprise! Robin Wells from the Red Cross said, “Vikki works day in day out from her bed, giving Pals a reason to wake up each day and something to look forward to. She provides a listening ear for families and always remembers when a child has a scan or important tests coming up. She was chosen as our winner because of her continued determination to support others despite her own difficult condition.” Robin Wells, Red Cross. Vikki was nominated for this award by several Post Pal parents. Dylan from the Community Channel visited Vikki to make a short video to be shown at the awards and on the channel. Vikki saw one of the pages of nominations and got all misty eyed! Earlier in the day of the awards event, Vikki and her Mum joined Fellows for lunch at Coutts bank, they had never felt so humble than when listening to others talking about their life’s work changing the world around them. 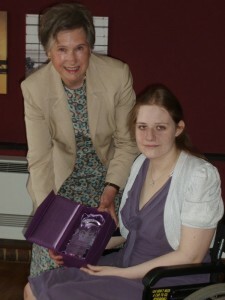 In the evening a formal award ceremony was held, where the video Dylan had made was shown and the award presented by Martyn Lewis. The video was fantastic and we still use it to this day! Post Pals started with a lottery grant via the Princes Trust. In 2006 we were invited to an award ceremony at the BBC studios in London. The team organising it were very kind and made lots of provisions which enabled Vikki to attend – her first trip out the house for 6 years. 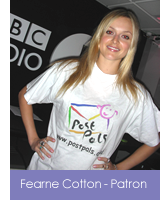 The award in our category was presented by Fearne Cotton. Vikki asked her if she would send a card to James who was finishing his chemotherapy, so she took our site details and has been involved ever since! She very kindly went on to become our patron. Vikki was contacted by Reader’s Digest who had heard about Post Pals and wanted to write an article. Much to our surprise when the article came out it was actually a 3 page article and back cover entitled “hero of the month”. In December later that year, Post Pals was featured again along with all the other heroes that had been in Reader’s Digest throughout the year and readers were asked to vote for their favourite. Much to her surprise Vikki won and we were told votes were a landslide! An award ceremony was planned to take place at the London Eye, however being bedbound, Vikki was unable to go. 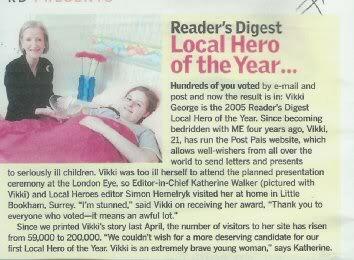 The Editor and Deputy Editor of Reader’ Digest visited Vikki at home and presented the award to her. The presentation was in the next issue of Reader’s Digest. This article was seen by Jan who got in touch and went on to become our treasurer! “We couldn’t wish for a more deserving candidate for our first Hero of the Year. Vikki is an extremely brave young woman” Katherine Walker Editor in Chief Readers Digest.